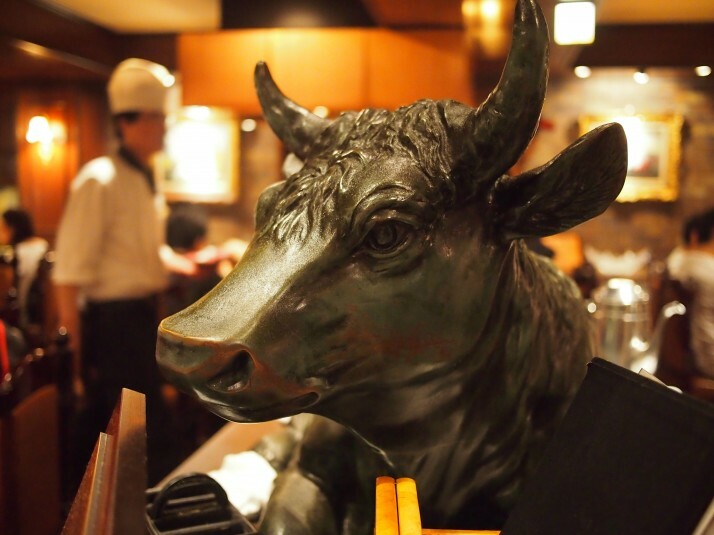 Julie and I were a bit skeptical about stopping off in Kobe for a couple of days, as we wondered what else there might be to do in this city famous the world over for the quality of its beef. Well, we couldn’t just eat steak all day now could we..
We were all set to visit a restaurant called Mouriya which has fantastic reviews, until we got talking to the folks at our hostel who recommended the theme-park-named “Steakland“, which we were assured was as good if not better. 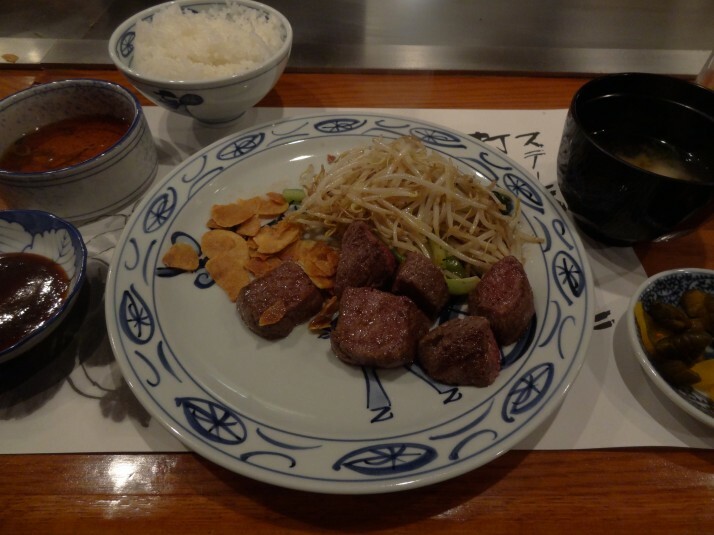 It was very easy to find, and when we arrived we found out the whole place is set up for teppanyaki – a cooking style where the chef cooks at the table on a large hot plate, which we later found out was invented in Kobe. 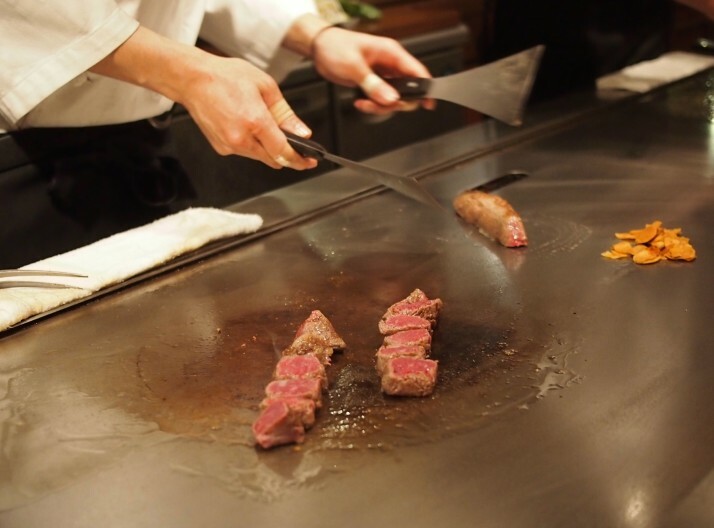 We watched our chef carefully, masterfully prepare our Kobe steak, before he placed the bite-size morsels on our plate. The texture on the tongue was of lightly seared beef, which gave in to our bite with all the resistance of a marshmallow. Then the fattiness and flavour of the beef hit us. Mmmmmm.. bliss. It is, to my carnivorous brain, the final evolution of the art of consuming beef. Yep, even to my well-travelled tastebuds, this is the best steak I’ve ever had. The Kobe Earthquake Museum. Why did they surround it with glass? 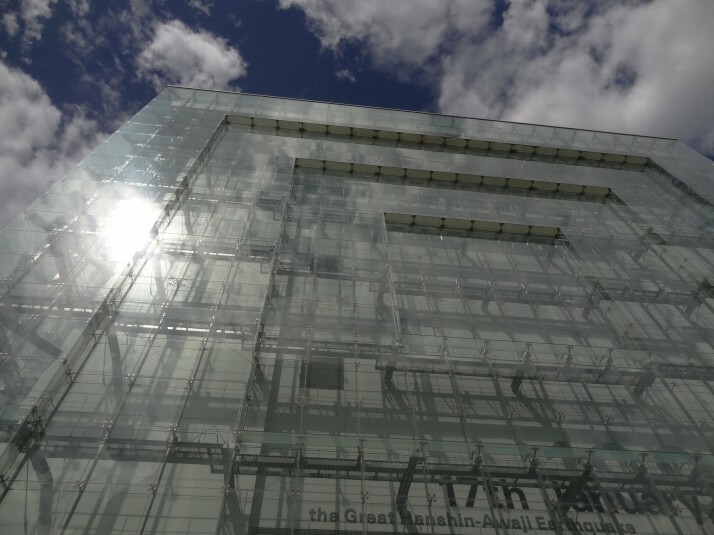 The Kobe Earthquake Museum, or to give it its full title: “The Great Hanshin-Awaji Earthquake Memorial, Disaster Reduction and Human Renovation Institution” (whew!) retells the story of the massive earthquake that occurred on the 17th of January 1995, measuring 6.8 on the Moment magnitude scale (the successor to the Richter magnitude scale). The Museum starts abruptly with an immersive recreation of the earthquake which happened in the early hours of the morning. The theatre is dark. The scene is set with stills of Kobe’s streets, shops and offices before the video and deafening sounds of breaking civilisation completely disorientated us. The video includes CCTV footage of shops and offices, and the devastation wrought was unbelievable. As we have travelled for the past 15 months we’ve recognised places and names, mostly because we’ve seen or heard about them on the news, but neither of us recalled anything of this disaster which took 6,434 lives. 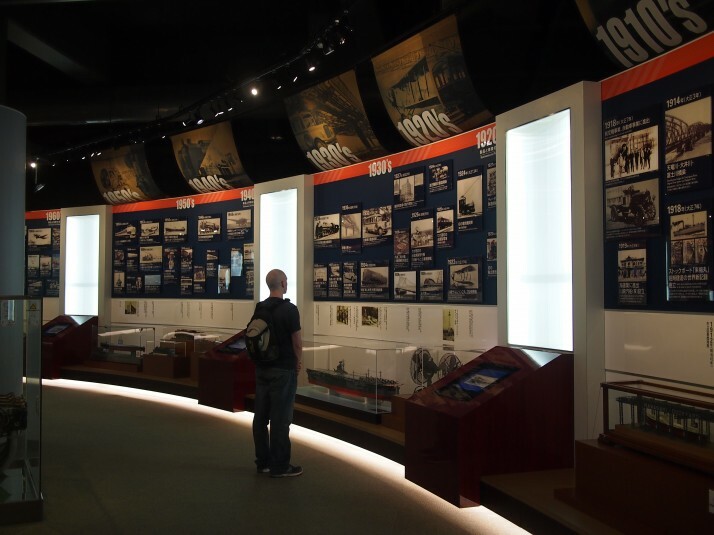 The museum goes on to describe the immediate aftermath, which was explained to us by very friendly English speaking members of staff who added their own stories of the tragedy. It was fascinating to hear that so many rules and procedures have been introduced as a result of the Kobe disaster. Some examples we were told about were that relief efforts were delayed because of hierarchical authorisation which has been changed in the event of earthquakes, and that fires were caused by the electricity being reconnected – now they inspect the power lines and restore it in stages. 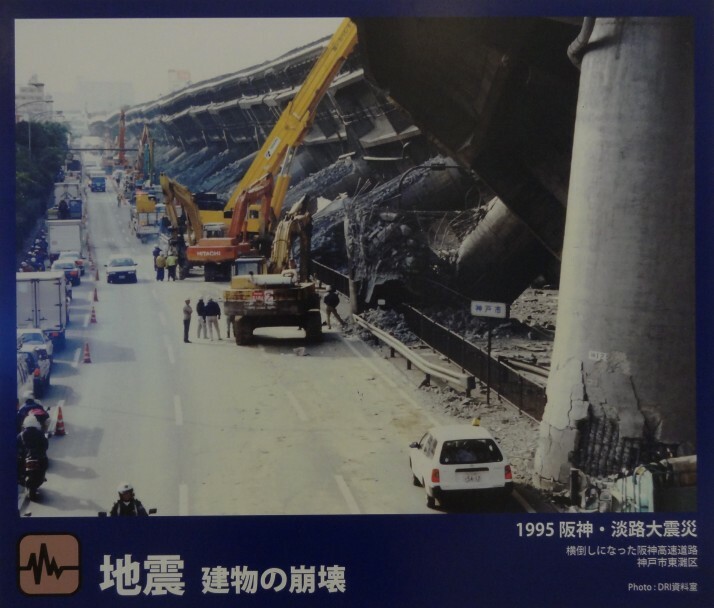 Engineers and support staff from Kobe have provided assistance at subsequent earthquake relief efforts not just in Japan, but around the world. 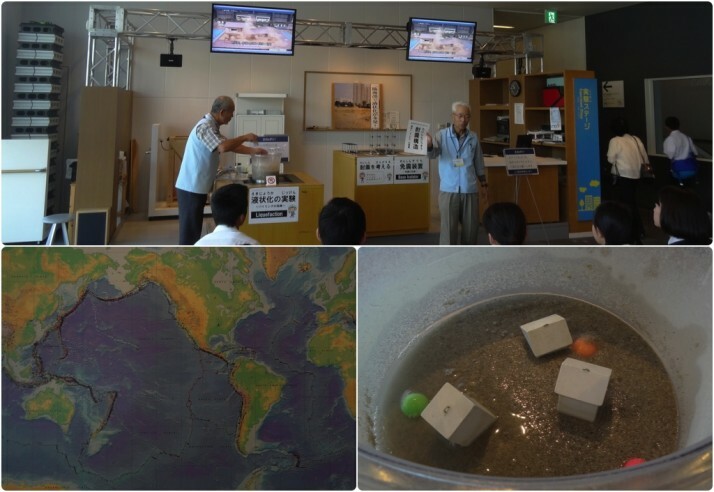 We thought the interactive visual displays were excellent; a simple bucket of sand demonstrated liquefaction, and a vibrating table demonstrated seismic base isolation. With the delightfully translated name of “Good Times World”, the history and accomplishments of the Kawasaki company was pleasantly impressive – for being more interesting than we had hoped, the amount of information on show, and for the breadth of industries Kawasaki has been involved in. 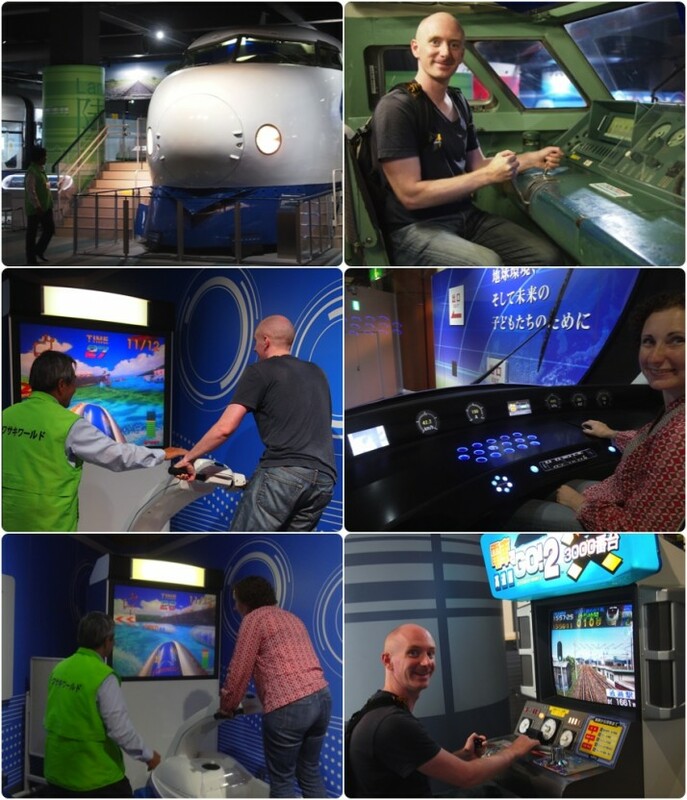 We learnt a lot about the company and its creations that we had no idea about before, like they build the Shinkansen bullet trains and the tracks, they still make huge container and transport ships which is how the company started, they own the trade mark “Jet Ski” and they built the machines that dug the Eurotunnel! The museum has examples of almost everything they make, which we had fun climbing into and playing with. 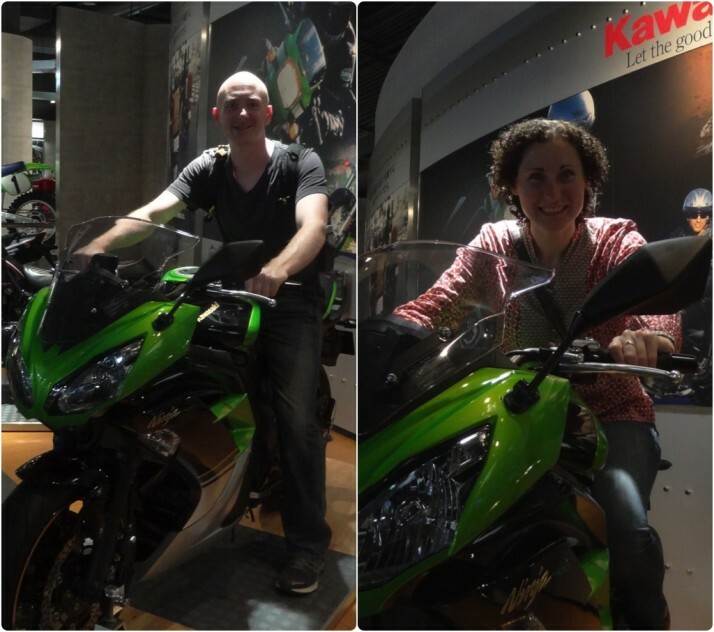 Kawasaki Good Times World – Good Times indeed! 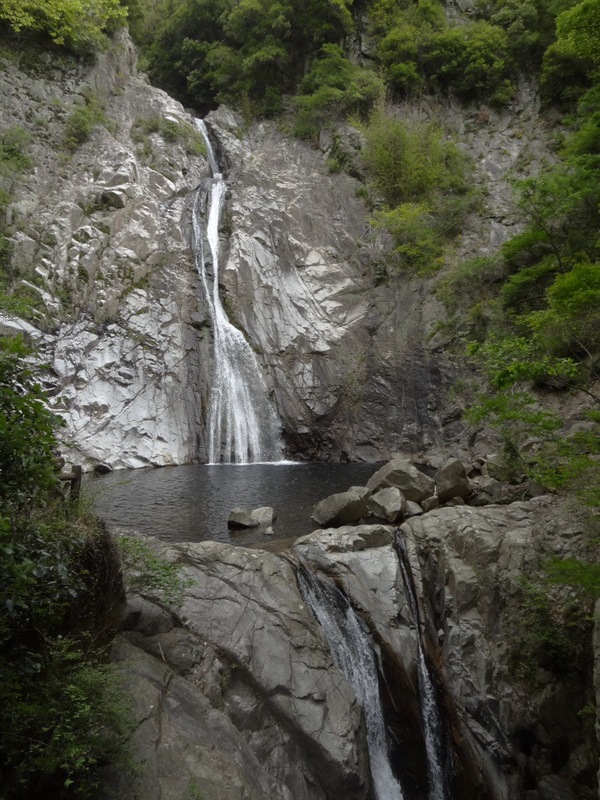 Just 5 minutes north of the Kobe Shinkansen bullet train station is a narrow valley between Mt Futatabi and Mt Maya that leads up to the Nunobiki waterfall. A little further up the trail we passed a reservoir which would have been a welcome stop were it not for the annoying public announcement being looped through loudpseakers! A Kobe reservoir. It holds water. We didn’t stop for long. What more can I say? 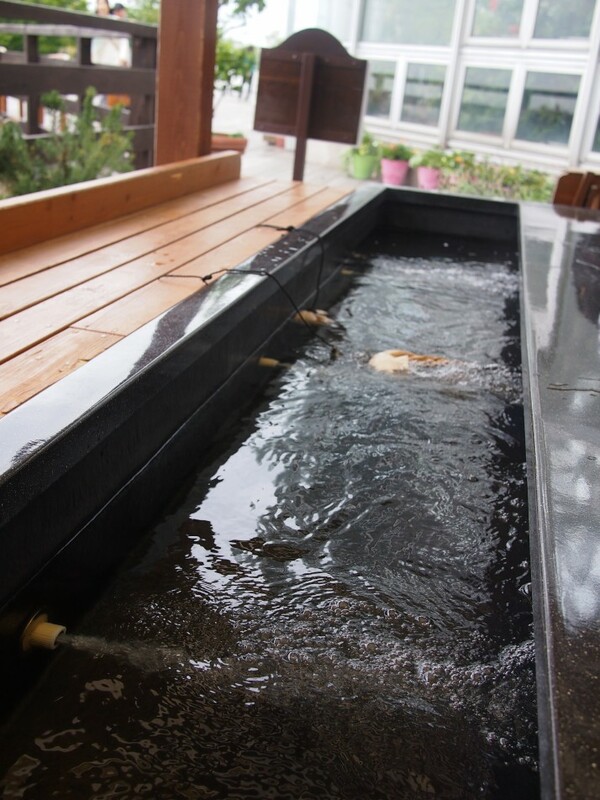 We pressed on, and made it to the Nunobiki Herb Gardens and Ropeway, which can also be reached by said ropeway from the lowest cablecar station near the Shinkansen train terminal. 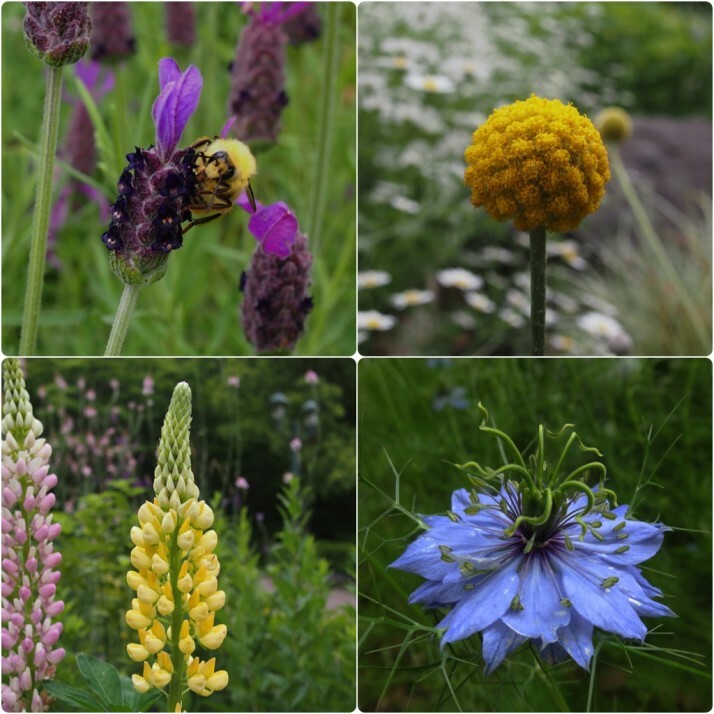 The Herb Gardens purport to be Japan’s largest herb and flower garden, with some 200 species blooming throughout the year. We really enjoyed the variety of the gardens, and as we’ve come to expect in Japan it’s very well laid out too, although as we started at the bottom some of the hills were quite steep to walk up! As well as the herbs and flowers, the gardens have a number of art installations, and a lovely greenhouse complete with a herbal foot-bath that Julie couldn’t resist after all the walking we’d done! While she soaked her weary feet, we ate the various flavours of bagel we’d carried from the bakery next-door to our hostel, and admired the view over Kobe. It was a nice, peaceful end to our couple of days in this fascinating stopover, and a great way to make room for more delicious Kobe beef! 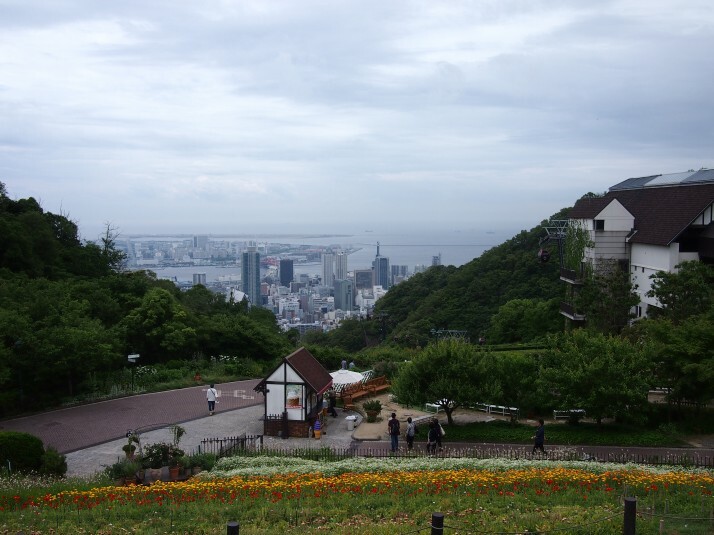 This entry was posted in Places and tagged Food, Garden, Japan, Kobe, Museum on July 4, 2014 by Andrew. When I was in Wellington Kobe was talked about a fair bit – part of Wellington is, like part of Kobe, built on reclaimed soft sand so they expect the Big One (when it hits) to have a similar impact on that bit of the city – houses collapsing into the ground, and issues with the gas mains and resulting fires. They’re using Kobe as a lesson. Wow, I’d heard of the odd earthquake in New Zealand, but I didn’t know that it’s on the Ring of Fire with Japan and California. Did you feel any shocks while you were there? I thought we might have done in Kyoto or Tokyo, but we didn’t. What is 21 + 32 ?